Combine all the ingredients and whisk to combine. Measure about 1¼ cups of the liquid and set aside. 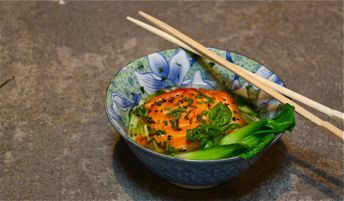 Place the salmon in a bowl, and pour the remaining liquid over. Toss to coat, then marinate for about 10 minutes. Place all the ingredients in a small saucepan and bring to a boil over medium high heat. Simmer for 2-3 minutes, then remove from the heat and let cool to room temperature. Strain and reserve the liquid. Preheat oven to 400 degrees. Remove the fish from the marinade and pat dry. Heat a medium sauté pan over medium high heat. Add enough olive oil to barely coat the bottom of the pan, then add the salmon and brown both sides. Remove from the pan and place in a shallow baking dish. Add the julienned carrots, ginger and the reserved liquid to the dish and cover with foil. Place in the oven and cook until the fish is barely done, about 6 minutes depending on thickness. While the fish is cooking, heat 4 serving bowls. When heated, divide the asparagus, green onion, and herbs between the bowls. Remove the fish from the oven and place a piece of fish in each bowl with some of the liquid. Drizzle with a little of the hot chili oil and serve immediately. Adding some cooked rice to each bowl is a great addition to make a meal.